In September, I wrote about the Corn Refiner Association’s desire to re-brand high fructose corn syrup as ‘corn sugar’. Obviously, I have been pleased with the decline of high fructose corn syrup, and predictably, I am disturbed by the CRA’s rebranding attempt. It stinks like a last-ditch attempt to save an awful product, but the spin is so genius that it could pave the way for corn sugar to be bigger than HFCS ever was. The CRA began an advertising campaign to plant the idea that HFCS is no different than cane sugar. Their first television commercial was well-produced. I would embed it here, but CRA’s YouTube account appears to have embedding disabled for all their videos. You’ll just have to go to YouTube to watch it, or you can read the transcript below. If you’re like me, you care about the food your family eats. I was pretty confused about everything I’d been hearing about high fructose corn syrup. So, I did a little research to find out what independent experts like doctors, dietitians and nutritionists had to say. I learned whether it’s corn sugar or cane sugar, your body can’t tell the difference. Sugar is sugar. And that’s one less thing to worry about. It’s a brilliant advertisement, particularly the line “whether it’s corn sugar or cane sugar, your body can’t tell the difference.” In one broad stroke, the CRA dumps the bad reputation of HFCS and aligns itself with natural sugar. Sugar producers took exception. And now they are taking the corn refining lobby to court. The suit, filed in U.S. District Court in Los Angeles by Western Sugar Cooperative, Michigan Sugar Co. and C & H Sugar Co., charges the “corn sugar” branding campaign constitutes false advertising under federal and state laws. Companies named as defendants include Archer Daniels Midland Co., Cargill Inc., Corn Products International Inc., Penford Products Co., Roquette America Inc., Tate & Lyle Ingredients Americas Inc. and their marketing organization, the CRA. “If consumers are concerned about your product, then you should improve it or explain its benefits, not try to deceive people about its name or distort scientific facts,” said Inder Mathur, president/CEO of Western Sugar Cooperative. The sugar producers seek an injunction to end the advertising campaign and also seek damages, including compensation for corrective advertising. Sugar manufacturers argue that “corn sugar” is already the FDA-approved name of a corn-starch based sweetener; that advertising high fructose corn syrup as a natural sugar is false because it contains no naturally-occurring fructose; and that advertising the nutritional equivalence of sugar and high fructose corn syrup ignores the research suggesting possible health differences. In the United States, false and deceptive advertising is illegal. The standard for what constitutes false advertising has changed since early consumer protection legislation was introduced. Today, “what is illegal is the potential to deceive, which is interpreted to occur when consumers see the advertising to be stating to them, explicitly or implicitly, a claim that they may not realize is false and material”. Note the key words at the end of that sentence: False and material. A deceptive advertisement must be false, and that falsity must matter. An advertisement showing a truck towing the moon is obviously false, but immaterial since a reasonable person would not be deceived. 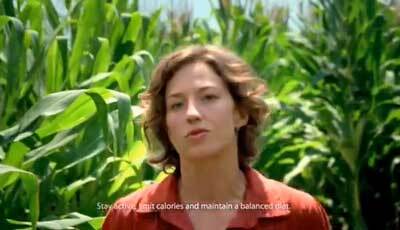 I believe that the corn sugar advertisements produced by the Corn Refiners Association are both false and material. Corn does not naturally contain sugar. You can’t break a cob in half and sweeten your morning coffee. Refining HFCS from corn is an extensive chemical process, and the name corn sugar does not reflect the difference. That’s misleading, and it’s also material because it speaks directly to an attribute of the product that matters: Whether or not it is sugar.